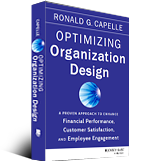 Over the past 20 years, Capelle Associates has received many comments from executives sharing their success in Optimizing Organization Design®. Coming from our clients, these testimonials are a proof that our approach has helped organizations achieve the benefits of better financial performance, employee satisfaction and customer satisfaction. We are happy to share a few of these comments with you. I thought I would provide an update as we are now in the eighth year from the time that you initially supported us with an organization design assessment and implementation. Over this period of time there have been a number of significant events, including a change in our distribution model, the retirement of four members of our senior leadership team, and two new Presidents. Even though these key events created significant changes within the organization, all of the key foundational organization design principles have remained intact within Allstate. The project team that re-designed the new distribution model used the principles of cross-functional accountability and authority utilizing project management rigor to clarify deliverables and roles. Three of the four leadership team roles were filled by internal employees who had been identified as high potential through our annual Talent Pool review process. In the last couple of years we have revisited our Vision/Mission and have engaged employees to develop a simplified and more meaningful Vision/Mission. We have also undertaken a significant strategic review that is identifying key strategies and tactics that will be employed over the next several years. A formal process has been established to help us assess and evaluate all current projects, align with key strategic deliverables and identify clear resource and cross-functional accountabilities and authorities required to successfully deliver. Finally in 2013, we have been selected by AON Hewitt as one of the Best Employers in Canada. On debriefing us, they indicated that one of the key points of feedback from employees was identifying career development and career opportunities in the company. We attribute this success to the formal institutionalizing of the Talent Pool review process that was implemented as part of the organization design work. As a testament to how sustainable some of this work is, and continues to be, is the continual use of common language such as stratum of work, valuing work, cross-functional accountabilities and authorities, and information processing capability. Clearly our employees understand how critical these concepts are to developing and sustaining a very successful organization. In addition, over the last three years, we have outperformed the industry on all key performance metrics. Our data now shows that we are the only company in all of Canada our size or larger to have grown revenues and net income on an uninterrupted basis for 12 years in a row. I am confident the work our teams have done on organization design contributed to our unparalleled success. We have recently been awarded the Great Workplace Award by the Gallup organization. The award positions LS as being one of the most engaging companies in the world. In 2013 only 32 companies globally received this special recognition, with LS being the sole retailer in the group. While we have worked hard on many fronts to achieve this level of performance, we believe that our organization design practices have provided an important foundation for the deployment of our employee engagement initiatives and would like to thank Capelle Associates for their support in that regard. Process improvement efforts will fail to realize their potential unless the organization and its behaviours are fully aligned. The Capelle Associates approach squarely addresses this gap through standardizing structures and accountabilities within and across functions, followed by a critical evaluation of individual capabilities to perform these roles – all based on proven science. The result reduces re-work and variability in communication, speeds decision-making and delivers increased value for the paying customer. Just like a lean manufacturing system attacks waste and cycle time, this methodology provides the same critical framework for effective leadership and strategy execution. The organization assessment you carried out provided excellent insights, and your recommendations set a baseline for improvements that we have made to the organization. In addition, the implementation consulting support provided us with methods, materials and training, so we did not have to “reinvent the wheel”. There is no question that you have helped us to achieve significant improvements in our organization … Your firm’s consulting expertise is world class. You and your team were always available, and we appreciated the quick turnaround time when it was required. We also appreciate your flexibility in providing guidance and support as and when we needed it. Capelle Associates completed a review of our entire organization and then assisted us with implementing the improvements. We found their research based assessment method to be both thorough and practical. For our implementation, they brought in methods and materials that they had developed and worked with our internal team. The improvements were both significant and sustainable. We found that better aligning positions, clarifying accountabilities and authorities, matching people to positions, and developing business plans has resulted in improved employee performance and customer satisfaction. The organizational design support Ron Capelle and his team provided us helped create role clarity and accountability across the organization. The methodology paved the way for a more transparent and productive organizational structure allowing managers more time to focus on operational excellence. How many layers should my organization have to be most efficient? How can I be sure that I have the right people in the right seats and promote them from within? How can I reduce micromanagement and improve cross functional efficiencies? How can I trust that the organizational design and everyone’s work is supporting the deployment of the strategy? Capelle Associates Inc. provides surprisingly clear answers to all these questions, and a robust methodology of deployment. The result is a stronger, leaner and clearer organization, where everyone can focus on moving the business forward. While the theory behind organization design is not new, the benefits of its implementation to our business are certainly in with the times. For starters, we gained from our managers being provided with greater clarity, increased consistency and overall better discipline. Second, with a strong commitment from the top, our organization design initiative provided our people, from senior management to front-line, with more arsenal in their toolbox and helped them make better decisions as managers. The icing on the cake is that, although organization design did not start for us as a cost cutting exercise, it ended up paying for itself within the first year of implementation and that’s a recurring benefit. The application of Capelle’s approach focused our efforts to address some long standing opportunities for improvement. The decision making model, delineation of roles and responsibilities provides clarity and a framework for our team. Capelle Associates provided a high level of consistent, professional support for our efforts. We were pleased with their accessibility and availability. The logic of the Capelle Associates’ approach to organization design resulted in an unprecedented level of support at all levels, for a systemic change to CP’s organization. The approach to change management was extremely professional – highly detailed implementation plans at every stage and strong support from leaders before changes were implemented. Although the organization design model is time tested over many years and across numerous businesses and organizations, Capelle Associates were very mindful in their approach that management judgment must prevail. After Capital Power’s IPO we were at a point where we needed to ensure our organization structure was efficient and our employees were provided the right level of authorities and accountabilities to do their work. Capelle Associates organizational design model and implementation has made a significant contribution to the alignment of our people to the business results. For the past 8 years, Ron Capelle and Capelle Assoc. have provided advice on a number of corporate re-organizations to the Ontario Teachers’ Pension Fund investment division. He has provided advice to senior management at the divisional level on organization structures and assisted in individual departments such as fixed income and finance. The advice came at significant turning points in our history and helped to keep the fund competitive and focused on identifying unexpected risks while remaining at the top of our game. The implementation of better role alignment and related leadership processes, enterprise wide, lead to new found organizational capabilities and opportunities. One of the major benefits we gained is higher level of contribution from managers. We reframed the expected contribution and are now having managers think, talk and act with broader and longer term perspectives than we had before. This is to me a key foundation in ensuring that we deliver, by the appropriate roles and in a coordinated way, the right mix of short and long term results we require to materialize our strategic plan. Another improvement we benefitted from is more effective cross functional work. The combined effect of having better clarified the alignment of roles, accountabilities, authorities and business plans, provides our national organization with a system and process enabling leaders and employees to work better together. I also think that achieving significant progress, in a relatively short period of time, was made possible by working with Capelle Associates. Capelle Associates has provided organization design support to us for over ten years. They have conducted four major organization assessments. Each assessment has been rich in insight, thorough, comprehensive, very well documented, and focused in terms of recommendations. For others considering redesigning their organizations, I think that a strong internal – external partnership is critical. I am generally not a big believer in external consultants, but there are certain business issues and opportunities that require more specialized and independent methodology or perspective. I would put comprehensive organization design in this category, and our relationship with Capelle Associates as an example of a strong internal – external partnership that has lasted for over ten years. The strength of this partnership is based on two main factors: 1) the quality of Capelle Associates’ research methodology and 2) the experience, capability, reliability and trustworthiness of the members of their firm. Under challenging timelines and resource constraints, Capelle Associates have never missed a deadline or commitment. I have been using the Capelle Associates approach to organization design for more than 10 years and wanted to provide an overview of my experience. We have accomplished much over the years. Accountabilities are clearer. Administration is appropriately centralized. We created a new Product Development function to deal with the increasing complexity of this area. This separate focus helped us to accomplish much more than would otherwise have been the case. Similarly, we created a new function to deal with our fastest growing business line, which further enhanced its growth. In summary, we designed our organization to better achieve our strategy. In fact, I believe that organization is part of strategy, and is divorced from it to the peril of both. The benefits to our organization are multiple. First, we are clearer about our objectives. We have a cascading business planning and review process and measure our performance carefully. Employee opinion surveys, which are conducted by an independent third party, have shown excellent improvements in employee satisfaction, particularly with regard to knowing what’s expected. In this regard, our results far exceed industry benchmarks. The satisfaction of external stakeholders is also surveyed annually and we have consistently achieved high scores on an international benchmark. I recommend the Capelle Associates approach to IT senior executives that are looking to improve organizational performance. Their approach is powerful as it provides senior executives with a more comprehensive framework for aligning strategy, roles, accountabilities and tasks in complex situations. This approach is helping us execute our IT plan, improve efficiencies, make better staffing choices and is having management and IT professionals do work at a higher level than we had prior to this assignment. Our role descriptions and jobs are clearer, with more clearly articulated accountabilities and authorities. We are clearer about what jobs are worth from a compensation perspective, and have improved our compensation systems and practices. We have become more objective and disciplined in matching people to positions, particularly when it comes to promotions. One of our biggest improvements has been in business planning. Because we had taken the time to properly align the organization, we have been able to create and overlay a cascading business planning and review system in which employees have clearer deliverables with more appropriate complexity at each level. This is extremely powerful. In summary, improving the organization design brings clarity to so many different areas. I believe that we have increased our effectiveness while also achieving efficiency gains. We have reorganized significant parts of our business, improved role clarity, created “deeper” jobs, reduced “white space” between positions, improved succession planning, and strengthened cross functional relationships. While cost savings were not a significant driver of wanting to improve our organization design, improving our organization alignment has produced significant cost savings. Being in a growth business, we have chosen to re-invest much of these savings into positions that can further enhance our return on these investments. I would encourage CEO’s to review and refresh their organization designs. I would strongly recommend Capelle Associates for their unique research-based approach and excellent support. They have certainly helped us to further improve our business. We have accomplished a lot. Interestingly, one of the important outcomes was better understanding why we weren’t able to accomplish some things. This understanding was critical in our change process. For example, we understood that being caught up in silos was related to misaligned roles and unclear cross functional accountabilities and authorities. Roles are now clearer, and jobs are deeper and more robust. I believe that we can better match people to positions and have better succession planning. We have eliminated some jobs, and invested in other higher value added jobs. We can better coach employees in this system, and this is related to lower turnover. Breaking down silos results in better customer focus and leads to better retention and satisfaction of customers. Capelle Associates gave us a thorough and insightful assessment of our organization. This cannot be done from within an organization. With Capelle’s help we have been able to move further and faster as we create role clarity, align deliverables with our business plans and most importantly, clarify cross-functional accountabilities, reducing inefficiencies and silo thinking. We have been able to utilize these principles to strategically realign several critical Human Resources’ systems and practices. Of greatest significance is the impact they have had in the areas of Talent Management, Talent Pool Assessment, Compensation and Job Evaluation. There is already tangible, measurable evidence of significant returns driven primarily by the principles and methods inherent in our investment in organization design. Organization design does not appear to be on the agendas of many Boards of Directors and CEO’s. Since it has been shown to be a driver of organization performance, it deserves a higher profile. CEO’s should be accountable for developing, implementing and maintaining superior organization designs. Boards of Directors should be accountable for ensuring that this happens. The Capelle Associates approach to organization design has been shown through research and client experience to be related to better financial performance, better customer satisfaction and better employee satisfaction. Ontario Teachers’ Pension Plan has benefited from the Capelle Associates approach to organization design through both being a sponsor and participant in a global research project. We have benefited from high value organization design work that they have done for us – they have certainly added value to our business. More than two years have now elapsed since your final presentation to me and other members of our Management Committee of the analysis, conclusions and recommendations arising from your review of our Design and Procurement Department. With the full benefit of hindsight I can only reiterate the statement I made to you following your final presentation This is the best value for money I have ever experienced from any consultant. Your research methodology was extremely thorough and detailed, enabling all our stakeholders to understand our existing difficulties and many of their causes. The proposed organisational design had immediate face validity, as a result of which it was quickly accepted by all members of senior management and key leaders in the procurement area. The assistance you personally provided at individual and group level in the process of change management was truly invaluable. Productivity in the department has improved, and user satisfaction has increased remarkably while employee morale and team work have shown exceptional gains. Canadian Tire was recently selected as the Number 1 Company in the Best Companies to Work For in Canada published by The Globe and Mail Report on Business. Organization design has been an important part of our success. I want to thank you for your significant contributions in this area. Ten recommendations for organization and process change were accepted and implemented over a two year period. Customer satisfaction with our performance, as measured by three annual surveys, has shown improvement every year. Employee satisfaction, again, as measured by three annual surveys, has shown improvement each year. The clarity of organization responsibilities makes objectives setting and measuring a straightforward and believable process. I would recommend Ron to any organization wishing to evaluate the way it is organized. His analytical framework and his extensive research in the subject convince you that his recommendations are not just flavour of the month but are well anchored in practical experience. Overall, provided helpful insight and thought-provoking advice and counsel that advanced our work on organizational effectiveness to the greatest extent possible. Your availability/access with your busy schedule has always amazed me; very much appreciated. In most instances you exceeded my expectations (were always met). Stimulating, fresh ideas were always anchored in a disciplined (but flexible) approach. Given our on-going challenges (as a H.R. Division) I do not believe that our team would have been as successful as we have been without your consultations. You provided us with the frameworks we needed and the confidence to move forward. Many of the changes Ron recommended were implemented and in all cases, our operations have benefited. Employee satisfaction in both distribution centres’ is on the upswing. Employee Opinion Survey results indicates a steady improvement over the time span we have worked with Ron. In addition, operating results have also steadily improved over the same time period. It has been my pleasure to work with you on a major project designed to understand the relationship between organization design and performance in the global pension fund sector. The project was sponsored by 8 major funds. We were indeed able to establish a statistically positive relationship between organization design and performance using our performance data and your organization design framework. We found that Capelle Associates’ approach to better organization design is related to better financial performance in the global pension fund industry. This includes governance, layering and delegation. The project and its findings have had a significant impact on organization development within the 8 sponsoring pension funds. I would like to thank you for the organization design work that you did for the Federation in 1994. The groundwork that your work and your report laid out for us has served us very well over the years. In particular, the recommendations you made on the vertical and functional alignment in the Secretariat including our country and regional delegations have stood the test of time. The way we operate has improved significantly because of a clearer understanding of the relationships amongst these critical operating areas. I might add that the planning system we initiated with your advice is still thriving, and cascading, iterative work plans are a normal part of every manager’s working life. I recently won a prestigious award, Canada’s Call Centre Manager of the Year. I’m confident in saying that we would be struggling today if we had not implemented your suggestions. Getting the right organization design enabled us to do all the other things that were necessary to become successful. I specifically requested that you conduct an independent health check” on how our corporate staff was organized and how their commitment to service levels was viewed by their various internal customers. The quality of the report you produced was outstanding in its method of analysis, completeness and organization. However, you also did a remarkable job in your follow-up to ensure that key management staff were sufficiently conversant with all sections of the report to enable them to review relevant findings with their staff. The results of your work have provided a rich source of information and ideas which we are now committed to address over the next several months. Now, two years or so after your project, I have had the opportunity to reread your recommendations. Although not all were consciously acted upon, many were and those have proven to be wise decisions. Even some that we did not act on formally have in fact evolved to your solution; this is most encouraging. I have found your work always to be well planned and executed and your research timely and complete. What was most interesting was that, although to my knowledge you had not had a client in the software industry before, you were able to learn quickly to a sufficient degree to make your work relevant to our challenges. This was most helpful. By now you will have read the ‘Change’ page of Tuesday’s Globe and Mail. As you know, over the past few years the Passport Office management team has worked very hard to place the organization on a sound business footing. It is nice to see recognition of our efforts to date, particularly by a newspaper of the stature of the Globe and Mail. I would be remiss if I did not recognize the contribution you personally have made to our success. Your leadership, advice, and encouragement in the areas of empowerment of our Employees, de-layering of our organization, and Business Process Re-engineering of the passport issuance process have been key factors in influencing the path we have chosen, and the success we have had to date. We were indeed able to establish a statistically positive relationship between organization design and performance using our performance data and your organization design framework. We found that Capelle Associates' approach to better organization design is related to better financial performance in the global pension fund industry. This includes governance, layering and delegation.